Separate the tortilla wraps then spread each one with the hummus. Trim the stems from the chard leaves then cut the stems into thin matchstick strips and put to one side. Arrange the leaves over the wraps then top with the sliced chicken. Spread the soft cheese in a thick line down the centre of each wrap then sprinkle with pepper. Arrange the strawberry slices in a row on the cream cheese then drizzle with the vinegar. Top the strawberries with the chard stems, carrot and yellow pepper. Roll each wrap up then wrap in nonstick baking paper and tie with string or wrap in foil if preferred. Pack into a lunchbox with a frozen ice block to keep them cold. Unwrap and cut into slices to serve. 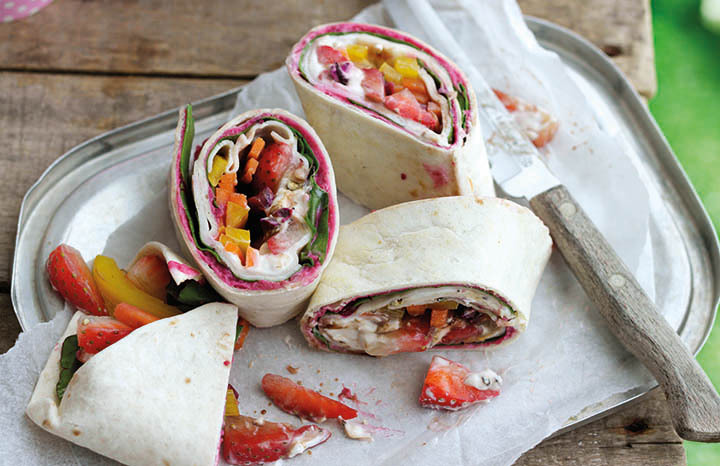 Add a splash of colour to your lunch with these delicious roll-ups!